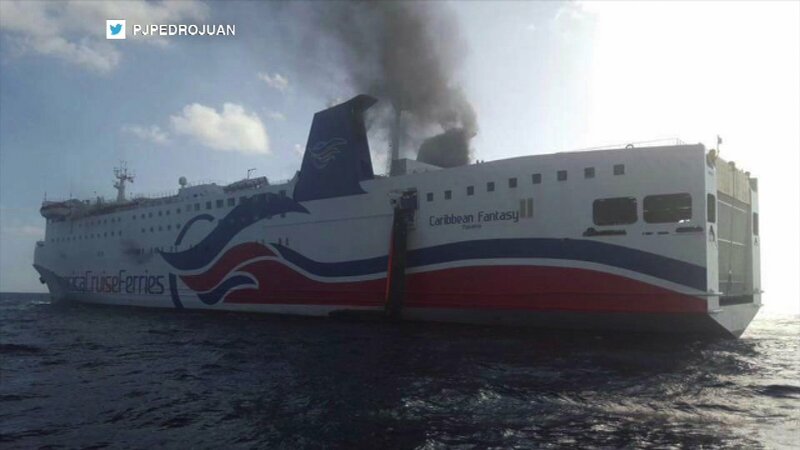 SAN JUAN HARBOR, Puerto Rico -- All passengers are off of the ship Caribbean Fantasy after a fire following its launch from Santo Domingo Wednesday. Rescue crews were still assisting 26 crew disembark. According to the United States Coast Guard, a 911 call came in at 7:42 a.m. reporting a fire that started in the engine room. The fire was spreading to other compartments of the ship, said Miami-based Coast Guard spokeswoman Marilyn Fajardo said by phone. Gyno Funes said he was one of two mechanics in the control room when a hose carrying fuel burst open and caught on fire. "We were trying to extinguish it for two hours, but couldn't," said the other mechanic, Marlon Doblado, after the two reached shore. More than 500 passengers and crew were forced to abandon ship, sliding down into rescue rafts. Passengers were being taken to Pier 6 in Pan American Pier. 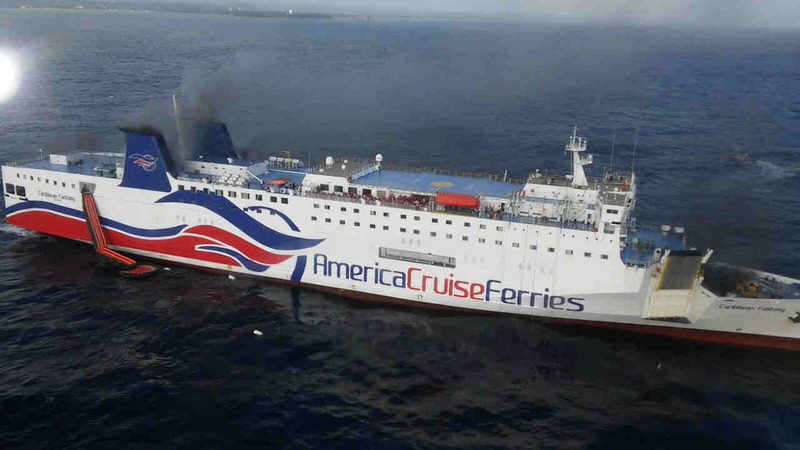 A small fire on a ferry off the coast of San Juan, Puerto Rico, forced more than 500 people to abandon ship Wednesday morning. The fire was still burning aboard the combination cruise and ferry vessel, as the rescue began. The fire department had a Facebook Live from the port showing rescue boats arriving at port. The ship was about 2 miles off San Juan Harbor. It had been en route to Dominican Republic. Local rescue crews and air support also were responding. No one is missing, Coast Guard spokesman Ricardo Castrodad said in a phone interview. The ship has seven levels, three of which are open to the public, as well as 140 private cabins and 450 seats. There is a casino, piano bar, swimming pool, nightclub and a collection of duty free shops on board as well. The ships run several times weekly between Puerto Rico and the Dominican Republic. The extent of injuries was not immediately clear. Several dozen people who were carried in on stretchers were being treated for dehydration, high blood pressure and respiratory problems from the smoke, said fire department spokesman Juan Vega. One stretcher held a man hooked up to an IV who was cradling a bawling newborn baby clad only in a diaper. The injured were followed by a small group of children who held hands as they disembarked the Coast Guard boats. The mostly Dominican passengers included dozens of school-age athletes headed to competitions in Puerto Rico, including a 22-member cycling team, a girls' volleyball team and a boys' baseball team. Passengers found to be in good health were loaded onto city buses to be taken out of the area. They included Fiordalise Pitchard, who traveled to Puerto Rico on vacation. "I feel nervous," she said, her hands trembling. "I was in the restaurant when I saw the smoke. I'm giving all the glory to the Lord today." Anguished relatives of passengers, including Hilda Pereira, pushed their way onto the scene. Her daughter, whom she has not seen for 14 years, was aboard the boat. Pereira said she was at the beauty salon when her sister called to notify her. "She said, 'You need to be strong,'" Pereira said. "The ferry has caught on fire."